Artemisia annua L. is the main source of artemisinin, currently the most effective treatment for malaria. However, an affordable and abundant supply of artemisinin remains elusive. Trichoderma is a biocontrol agent that stimulates plant growth and defense responses, and improves soil quality. To date, relatively few studies have focused on improving leaf biomass and artemisinin production in A. annua using Trichoderma. To investigate the role of T. asperellum ACCC30536 in improving the artemisinin yield of A. annua, field-grown A. annua was inoculated with T. asperellum conidia and grown for 60 days. The results showed that leaf artemisinin concentration and dry weight were increased significantly after inoculation. The optimal inoculation dose was 200 mL of conidia suspension at 1 × 107 colony-forming units (cfu)/mL, the highest artemisinin concentration was 8.83 mg/g, and the highest artemisinin production was 70.6 g on day 50. 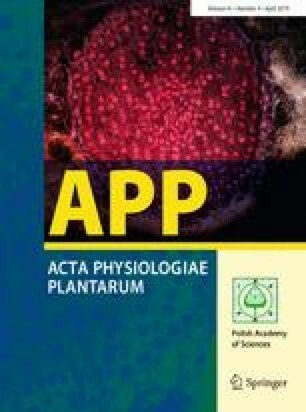 The results of qRT-PCR revealed that expression of genes encoding key enzymes for artemisinin biosynthesis, namely HMGR1, FPS, ADS, CYP71AV1, CPR, DBR, DXS1, and DXR1, was generally upregulated during days 20–50 following induction by Trichoderma. In addition, the moisture, pH stability, organic matter content, and availability of nitrogen, phosphorus, and kalium in inoculated soil were significantly improved. Thus, application of T. asperellum ACCC30536 may offer a novel approach for improving artemisinin production by upregulating the expression of key enzymes for artemisinin biosynthesis, increasing leaf yield, and improving soil fertility. Communicated by M. H. Walter. The online version of this article ( https://doi.org/10.1007/s11738-019-2836-7) contains supplementary material, which is available to authorized users. This work was supported by the National Natural Science Foundation of China (NSFC: 31370642), the State Key Laboratory of Tree Genetics and Breeding (Northeast Forestry University; 201202), and the Natural Science Foundation of Heilongjiang Province of China (C201216).